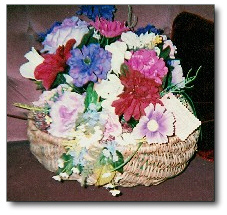 Large Victorian basket contains asters, carnations, daisies and white roses. Other colors are purple, burgundy, pink and white. Lilies of the Valley in front. 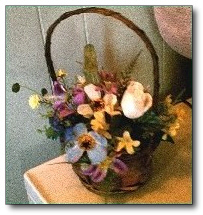 Medium – small Country Briar basket with white, rose, blue, yellow, pink and lilac assorted flowers. 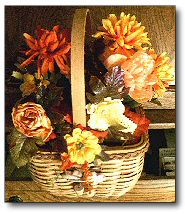 Extra large country basket with zinnias, petunias, carnations and roses. in blues, purples, reds and oranges. 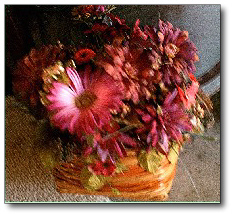 Country straw basket containing and assortment of burgundy, pink, fuchsia colored flowers and berries. 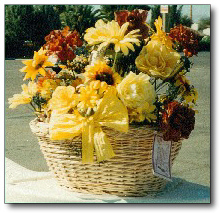 Large country heavy woven straw basket with yellow roses, large daisies, burgundy zinnias, small berries and baby's breath. A large yellow twist bow in front. 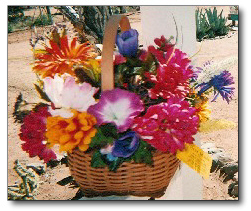 Medium country fill basket. 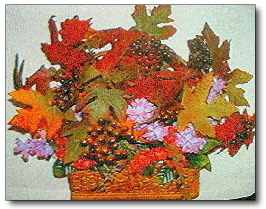 Assorted autumn leaves, brown and burgundy berries, small lilac and pink flowers. 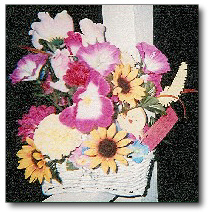 Medium country white woven basket containing purple petunias, sunflowers, white roses, carnations and small blue flowers. 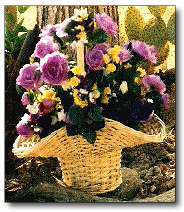 Extra large country ripple woven straw bucket containing large purple roses, yellow pansies, and small white and yellow assorted flowers. Medium woven straw basket with double handle. 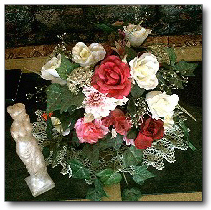 Contains assorted yellow, white and amber flowers with English Ivy. 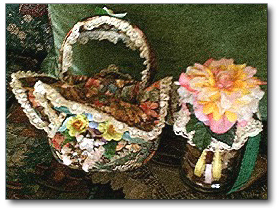 Country basket and bottle (with pin cushion on top). 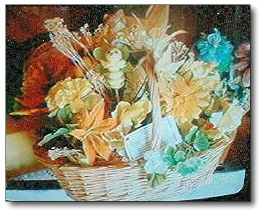 Basket covered with country print fabric with lace border and contains assorted flowers in yellow, pink, peach brown and blue. Handle covered with lace. 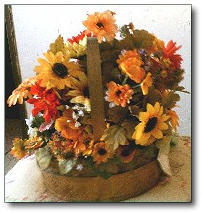 Country medium – small white woven basket with sunflowers, asters and white violets and a small fairy sitting in front of the basket with a green chiffon dress on. 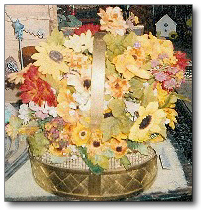 Large country woven basket contains large zinnias, tiger lilies, carnations in orange, yellow and white, and a darling little bumble bee in the middle with a yellow bow. 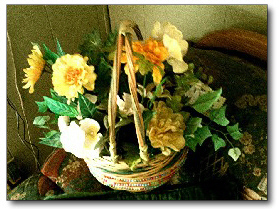 Extra large Star Bud Victorian basket with large horseshoe with black beads hanging from the middle of the handle. 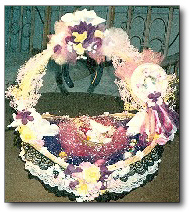 It's covered with black and white lace and lilac and white net with small yellow and white lilac flowers and purple, lilac and pink ribbon streamers on the Star Bud. Large country gold metallic basket weave design. 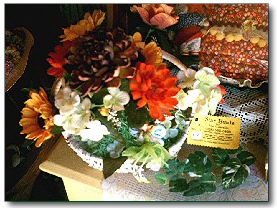 Contains an assortment of sunflowers, zinnias, pansies, marigolds and small white and yellow flowers.